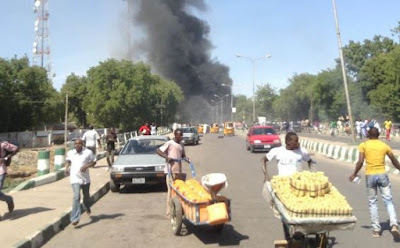 16 persons were killed and many others injured after a suicide bomber blew himself up at the Alhaji Haruna Dan Tilyan Mosque located at Layin Sama Ali Kotoko Street near the Maiduguri Monday Market today May 30th. According to reports, the suicide bomber disguised as one of the traders and blew himself up as the traders gathered for their afternoon prayers. The dead have been evacuated to the morgue while those who suffered injuries are currently receiving treatment at various hospitals. How can these punks be Killing Their People..So they never heard About CHANGE? Wetin come dey vex them boko boys. I thought dey have changed??? Linda take note! Buhari and Osinbajo should start dealing with this crisis. It`s becoming too much. Almost a million people have been killed thanks to their terror. Don't these idiots hear the news? Their ambassador is now the president. this one they bombing mosques, Allah no send una this one. If they're attacking their own now, what is their logic or aim? Scourge of the Earth. BUHARI O SETIGO!. OVER TO YOU. These people are just crazy. May Go forgive them. RIP to the dead.. Speedy recovery to those injured, and RIP to those dead.